Johnstone’s Decorating Centres is giving painters and decorators the chance to make some super savings in its next Bonanza Sale – launching in stores on Monday 8th April. Taking place across six days, the spectacular sale will feature a host of must-have deals and offers on a range of trade favourites and brand-new products, available only in Johnstone’s Decorating Centres. Fresh on the shelves and the latest addition to the Bonanza Sale is the new and improved Smooth Masonry – just £24.99 for a 5L colours. Formulated with quick rain resistance technology, the paint is now rain resistant after just 20 minutes and can be applied from 2ºC and rising, allowing for all season application. The Stormshield Masonry Kit – complete with 15” scuttle, 9” Stick System Roller Frame, 9” Masonry Rollers, 4” Masonry brush and more – is also on offer at just £10. Get them while stocks last because once they’re gone, they’re gone! That’s not all – for one week only, customers can get a massive 50% off 2.5L tins of Johnstone’s Trade Smooth Metal Paint, on offer at just £23.99, and an even bigger 55% off Johnstone’s Trade Flortred. The brand new Qtech Q5 HVLP Turbine 5 Stage Suction Gun (110v or 240v) for an unmissable £799! 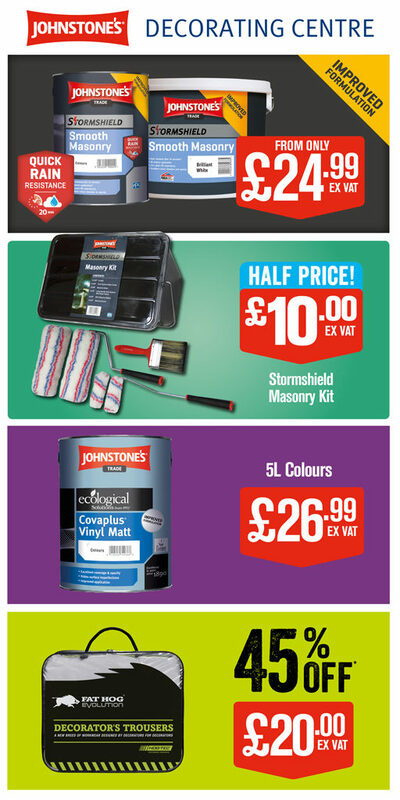 For more details on all the offers, or to find a local Johnstone’s Decorating Centre, visit www.paint247.co.uk. The Bonanza sale ends on Saturday 13th April 2019 – bag your bargains before it’s too late.